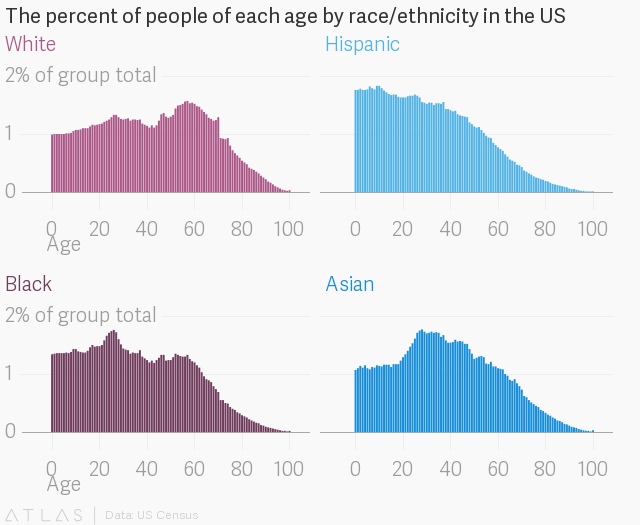 The demographics of the United States are changing quickly, and there is no simpler way to understand that than to look at the most common age of each race and ethnic group. The US Census Bureau recently released its estimates of the US population as of July 2016. Besides an estimate of the total population (325 million), the census also includes estimates of the number of people of every age within each race and ethnicity. For example, the census estimates that, as of July 2016, there were 976,288 Hispanic 15-year-olds in the country. Jed Kolko, chief economist of jobs site Indeed, combed through this data and came away with a fascinating insight. He discovered huge variation in the most common age—more technically, the mode—between each major racial group in the US. 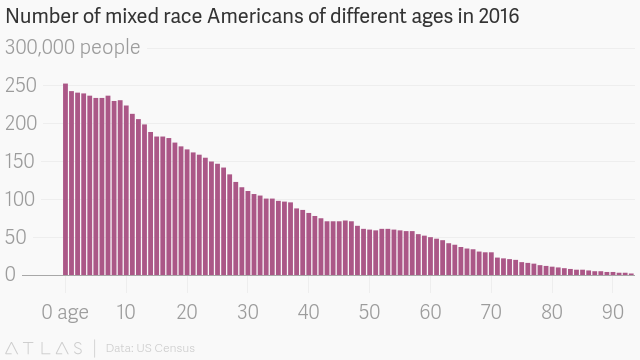 While there are more 57-year-old white people than any other age, the most common age among Asians is 28. For Hispanics, it’s 10. Perhaps most incredibly, the most common age for people in the US identified as mixed race is 0—babies that have not yet reached the age of one. For each group, the most common age is a result of some combination of fertility rates, immigration patterns, and changing social norms. For example, the most common age for whites is 57 because the late 1950s (a period when white people made up more than 85% of the US population) marked the very peak of the post-WWII baby boom. Ten-year-olds are most common among Hispanics because they’re the children of the wave of Hispanic immigrants that came to the US in the 1990s and 2000s. There are now more than 250,000 children under the age of one that the US Census identifies as mixed-race—more than 10,000 more than there are mixed-race Americans of any other age. This mixed-race baby boom is a result of the huge recent rise in interracial marriage in the US. From 1980 to 2014, the percentage of interracial marriages among couples where both people were under 35 nearly tripled, to 13.4% from 4.8%. That increase is partly due to cultural acceptance—as recently as 1950, mixed-race marriages were illegal in more than half of US states—and the fact that the US has become increasingly diverse. The probability of meeting people of another race or ethnicity has increased, and thus, so has Americans’ likelihood of marrying and having children with a partner of a different race.